St.Andrew’s choir is a voluntary choir of 22 singers covering the voice parts of Soprano, Alto, Tenor and Bass. 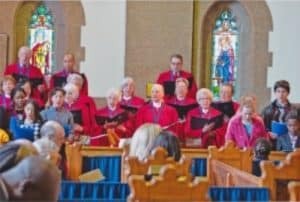 The choir sings at the traditional 9.30am church service every Sunday as well as at special services such as Easter and Christmas. We also participate in major National and Ecumenical Services such as the opening of Parliament and the Law Society Service as well as events like the Bible Society Hymnfest which is held annually at St.Andrew’s. Choir participation in the Sunday morning service each week involves the presentation of an introit at the start of the service and an anthem during the service. Where possible the introit and anthem are chosen to reflect the message set out in the lectionary of the day, thus ensuring that the choir music is an integral part of the church service.